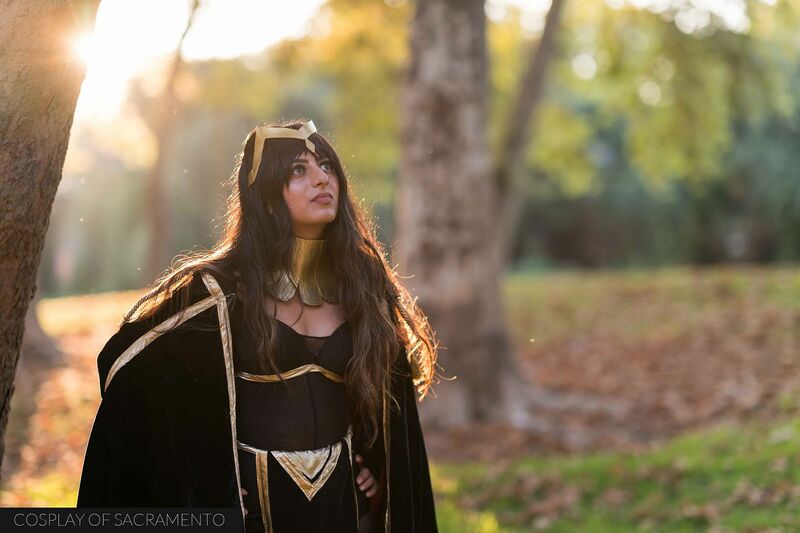 Today I got to shoot with Sim in her Tharja cosplay! 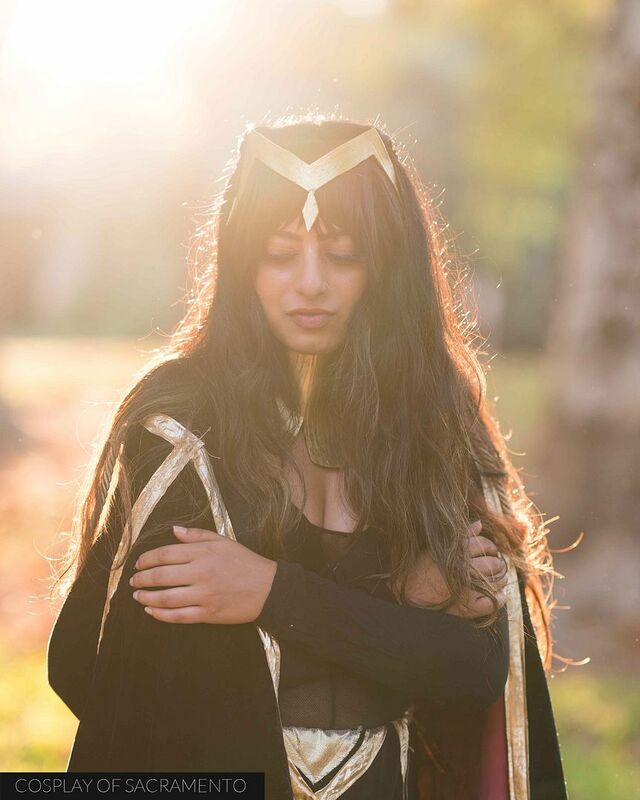 Tharja is a character from the popular long running Fire Emblem game series. This was my first time meeting and shooting with Sim, and it was a great experience! She's a super cool cosplayer and very fun to work with! If you're interested in finding out a bit more about Sim, she does have a Youtube channel. CLICK HERE to check out some of her videos. We decided to meet at Discovery Park in Sacramento for this shoot. I've shot at Discovery Park only once before, but the conditions weren't ideal that day. Today it was much, much nicer. We met in the early evening during the golden hour. The sun provided some beautiful soft light for the photographs. I tried to take advantage of this gorgeous light as much as I could. As you photogs know, the golden hour doesn't last very long! Because it was golden hour and I wanted to shoot quicker, I decided to go with only natural light. I've been wanting to bring out the speed lights for some flash photography, but it can be cumbersome. Flash photography definitely gives out a more contrasty image, but I find that the natural light also has a very pleasing softness to it. I guess it's just a matter of taste! All the photos taken today were using my Sony a9 with an 85mm 1.4 G master lens mounted to it. That particular camera is probably best for natural light as it has has lighting fast autofocus and uses an electronic shutter (something that's not ideal for flash photography). 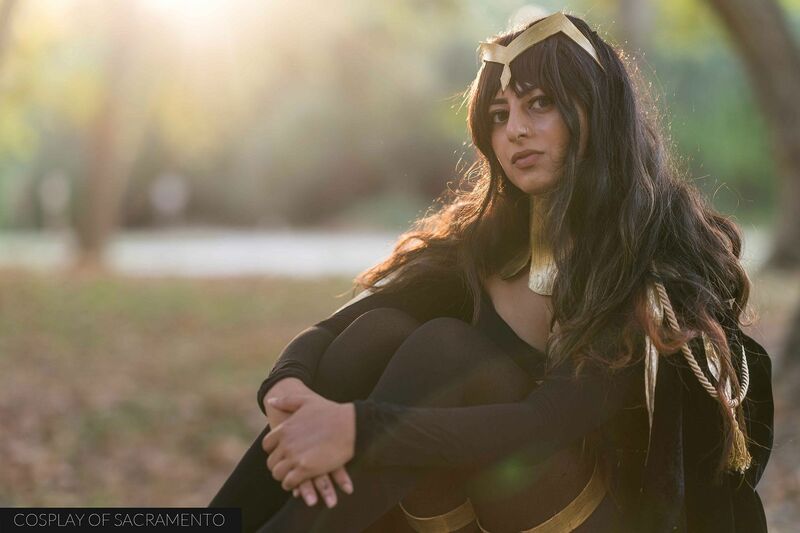 Sim's Tharja cosplay was very detailed and well thought out. Each part of the cosplay had intricate parts that took care to create. In terms of posing, I appreciated that Sim had ideas already in mind. We were able to shoot the poses she wanted as well as poses that I came up with during the shoot. The whole process was very smooth and we were able to do the entire shoot within an hour. It was a great pleasure working with Sim today. I loved the photos that we were able to create together and hopefully we'll be able to do another shoot sometime soon. CLICK HERE if you'd like to see the full gallery of photos from our time together. I'm back for the third and final day of summer SacAnime. Yesterday was an extremely busy day in which I tried to experience everything. Today I decided to slow things down, spend some time with people, and really concentrate on the cosplay aspect of the con. As typical, the final day of the con has a noticeably smaller attendance, but that was ok since it opened up a lot more space to move around in the hallways! I think a lot of folks took advantage of the third day to really connect with people. I saw a lot of people chatting and having conversations. Saturday has such a packed schedule that it can be hard to not feel rushed. It was great to catch up with the friends I saw and snap a few photos of them. The cosplay scene at the con continued to be on point today. A lot of fandoms were represented all throughout the event. These two Street Fighter cosplayers were upstairs doing moves to some music that they brought. Ryu was flipping around in the air! I got them during a moment of rest to get this quick photo of them. 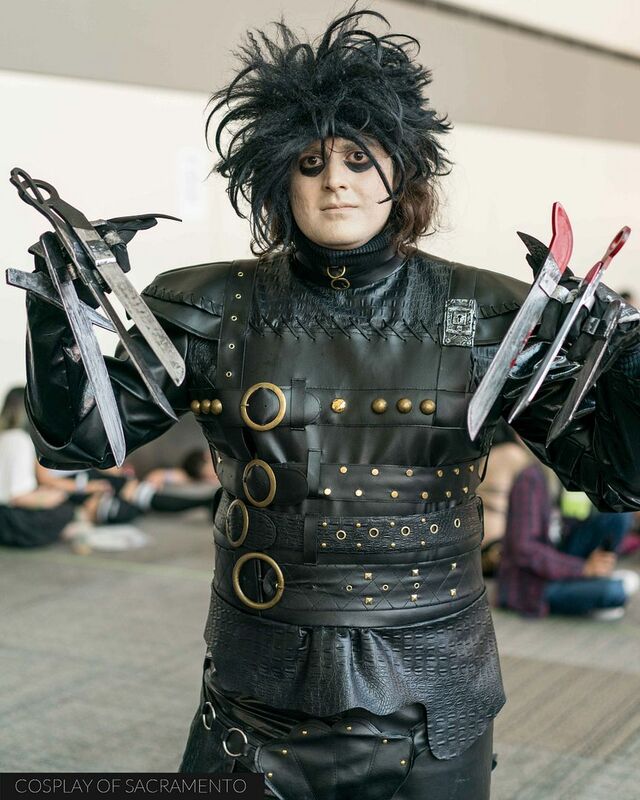 Check out this incredible Edward Scissorhands cosplay! Everything about this cosplay is spot on! I remember watching the movie when it was released - it really left an impact on me as I'm sure it did to many others. 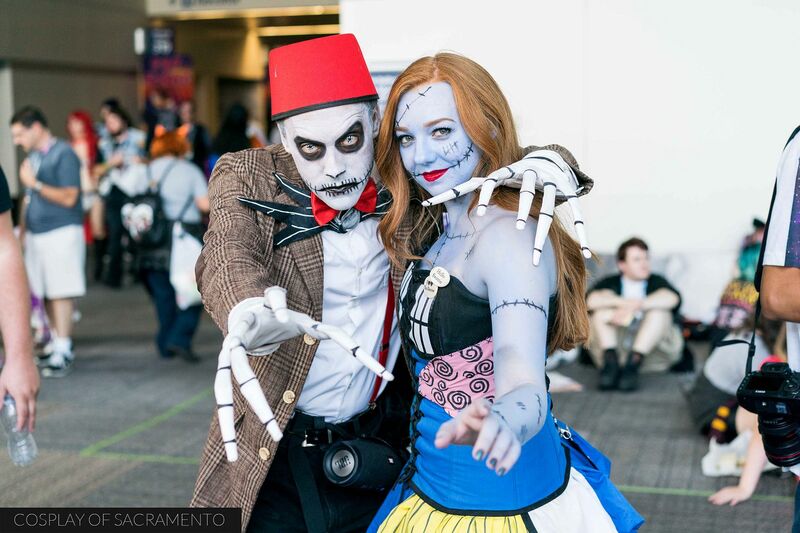 It's awesome to see an older movie like that get some sweet cosplay at SacAnime. I had some free time today so I had the opportunity to do a couple of short photo sessions. 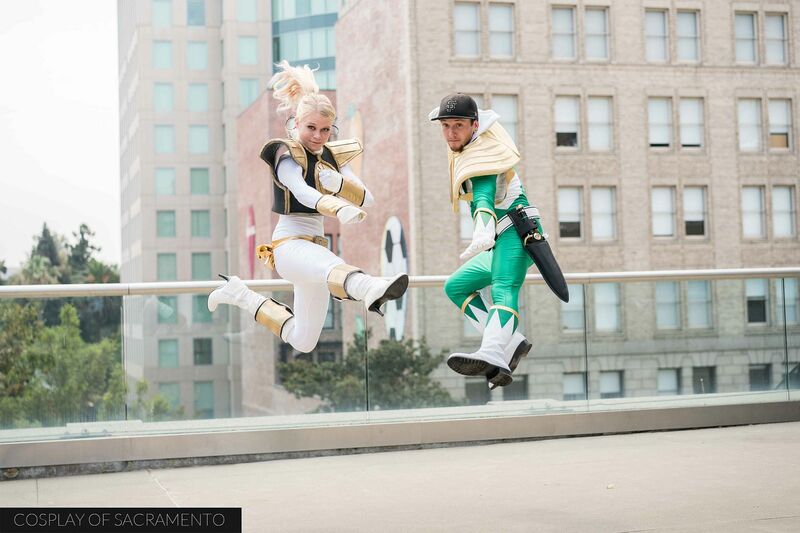 My first with was the white and green ranger. I really wanted to capture some action because that's what the Power Rangers are all about. I think we got some good air in this particular shot! My second mini session was with this punk Overwatch group. Overwatch was an extremely popular cosplay during SacAnime, but this was certainly one of the more unique Overwatch concepts. Each cosplay in the group is really well done and unique. I love all the looks they are sporting! Ahh, Summer SacAnime comes to a close. It's always a little sad when this convention ends as it is always one of the most enjoyable ones. Thankfully we get to do it all again come January! Can't wait! For now, CLICK HERE for a complete gallery of pics from this day! Day two of SacAnime was an incredible experience. There was so much to see and so much to do! I was excited and had a lot of energy, but I feel like I was only able to see a fraction of the content presented at the con. Today I made it a goal to get photos of outstanding cosplay, check out some group gatherings, listen to some panels, and attend the Geek Fashion show. It was a lot to attempt, but I gave it my all! One of the first things I did when I arrived was to go see the Final Fantasy and Overwatch gatherings. They were both going on at the same time so it was easy for me to bounce back and forth between them. I am a huge fan of all things Final Fantasy, so I had to check out the cosplays there first. 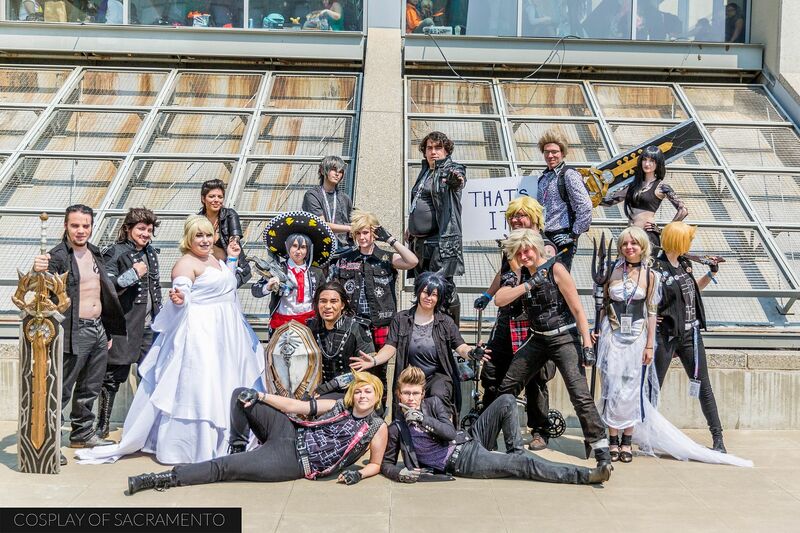 The gathering welcomed the entire series of Final Fantasy games, but the majority of the cosplayers were dressed in Final Fantasy XV cosplay, which makes sense as it is the latest release. I wasn't the only photographer capturing all the gathering action. There were a ton of others out there with their cameras clicking away. 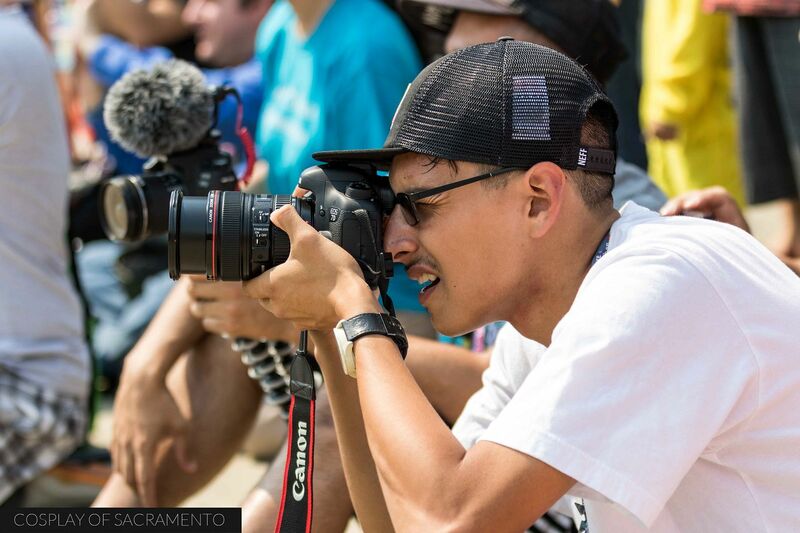 I would say most of the photogs were at the Overwatch gathering. The Overwatch gathering was absolutely HUGE. The group took up a huge portion of the upstairs balcony. It was hard to find a spot amongst everyone to take pictures but I managed well enough. I'll say this... there will be no shortages of Overwatch images coming out of SacAnime! Though I would call myself a bigger Final Fantasy fan, I really do love Overwatch and play it quite often on the PS4. Blizzard has a great game on their hands as it has really become a worldwide phenomenon. They have continued to update the game with new characters and skins so that gamers continue to keep interest. 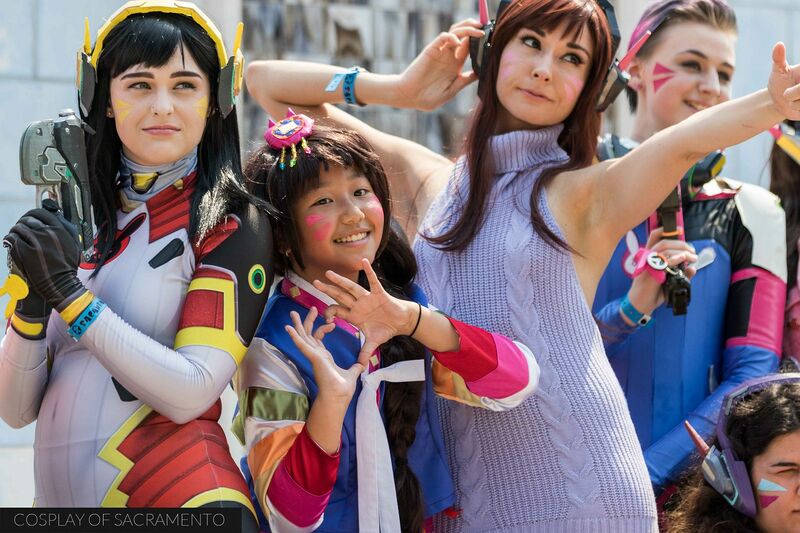 Cosplayers definitely have a huge choice when it comes to their Overwatch cosplay. Thanks Blizzard for all the variety! When it got too hot I decided to go inside and check out some of the panel rooms. These rooms ranged in size from a smaller hall to a big auditorium like the one pictured above. 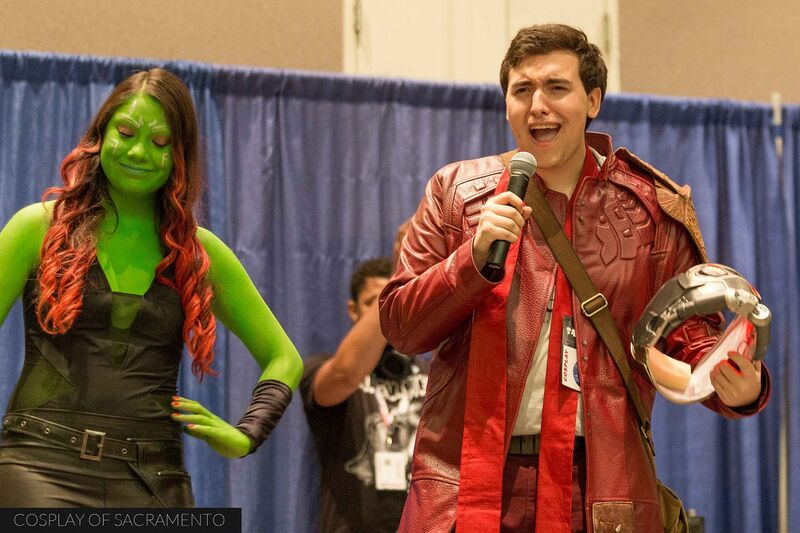 SacAnime had an amazing list of celebrity guests this year. 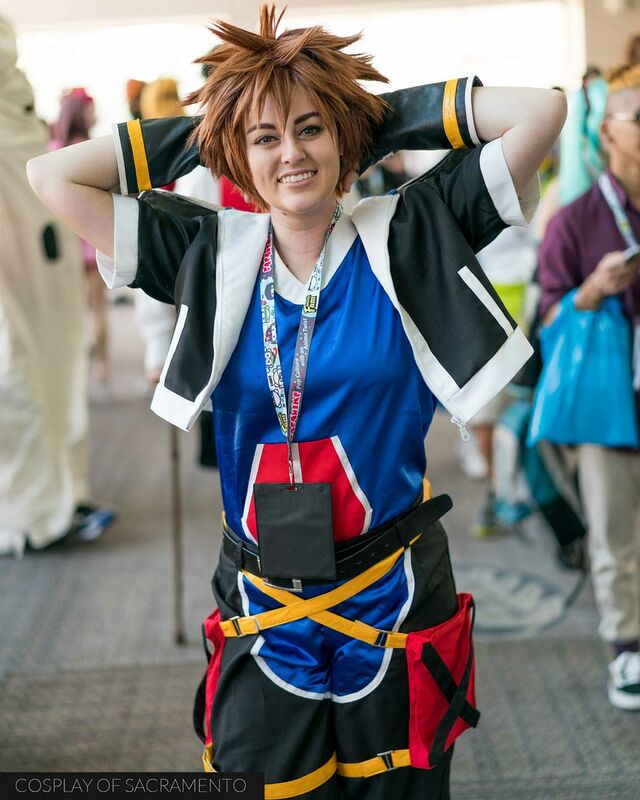 Con-goers packed the rooms to see and listen to their favorite stars. The question and answer portion of panels is one of my favorite things to be a part of. I like it because I love seeing fans interact with their idols. There is genuine emotion that often comes out as well as some really great questions. 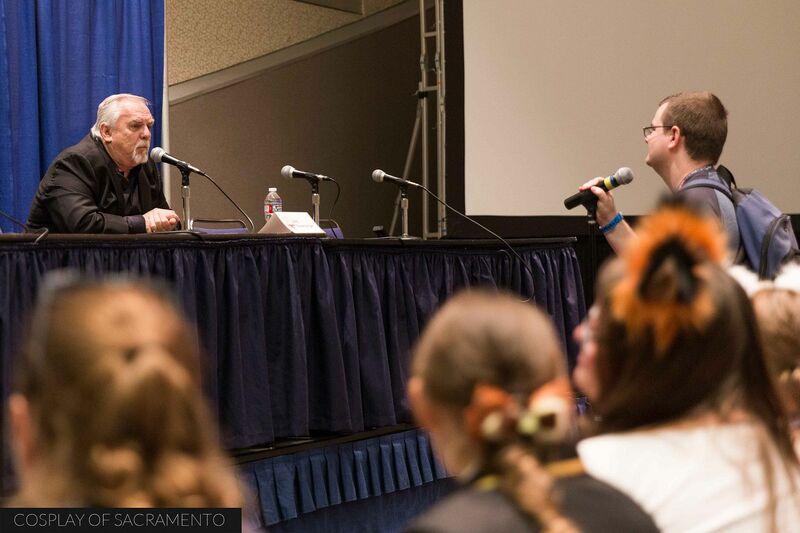 The picture above show a fan asking John Ratzenberger a question. You'll recognize John as one of the main characters of the old Cheers sitcom. If not, then you'll probably know him as one of the voices in your favorite Pixar movie. Also taking place inside were the numerous game rooms. Long tables were set up so that people could come and play competitive card and board games. Board games have become increasingly popular. The complex nature of many of them are a lot of fun. 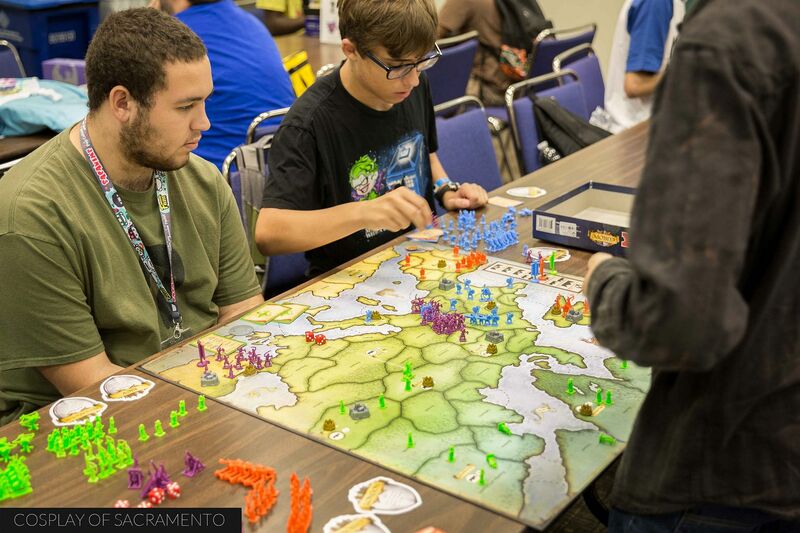 The awesome thing about this at SacAnime is that many of the board games are provided. Just pick one that you want to try, get a group together and have a ton of fun! Be it board games or card games, there are always people around in the rooms willing to get a game going. 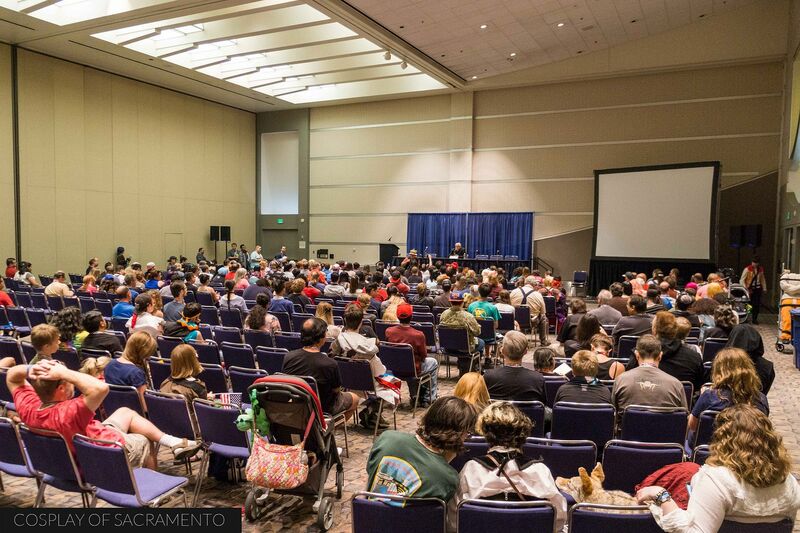 Of all the local cons, SacAnime has got one of the biggest rooms to play in. It was really impressive to see how many people were in there competing. If video games are more of your thing, another room was set up especially for video games. 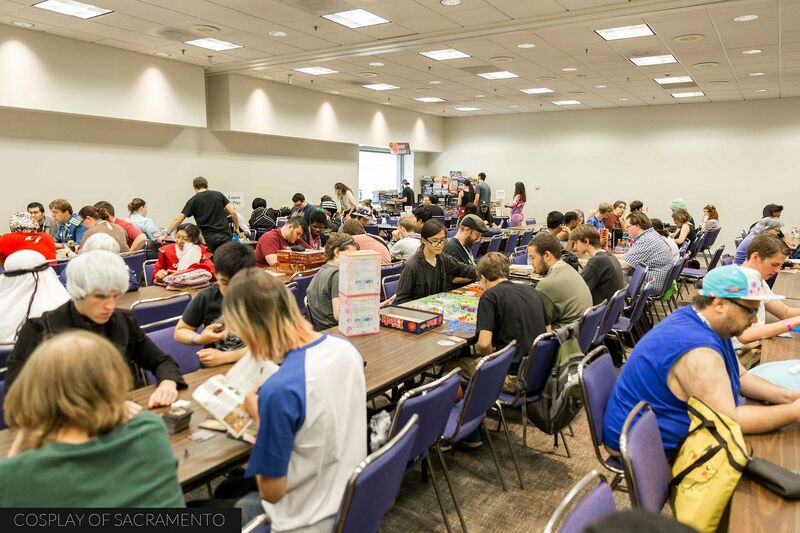 SacAnime really does have it all if you're looking to play! 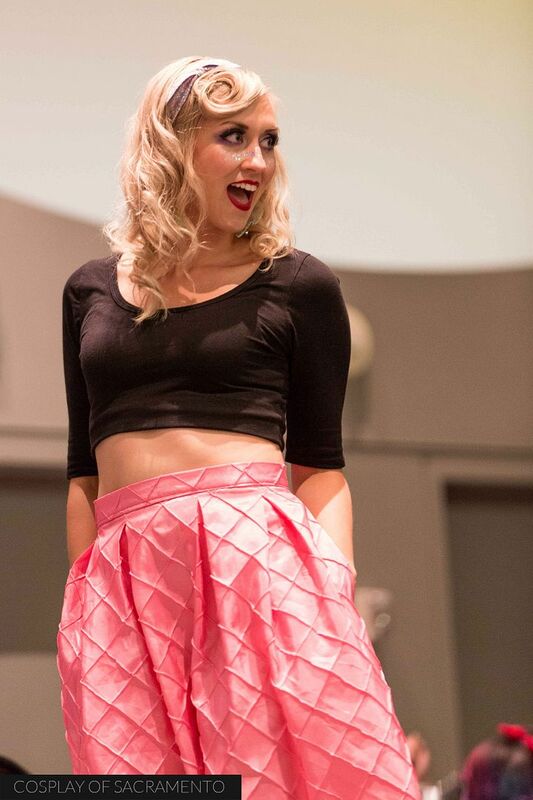 The Geek Fashion show is an event that I love covering. I regretfully missed the Stockton Con show, so I was really happy to attend this one. The Geek Fashion show is an event that showcases clothing lines that appeal to people who enjoy con-related things like Star Wars, comics, steampunk, etc. The models who come up on stage showcasing the clothes are all part of the local cosplay community. The Geek Fashion show has become a showcase event that definitely shouldn't be missed if you can help it. It was awesome to see many cosplayers I know up on the stage modelling some amazing designs. My friend November Cosplay actually had her own line of clothing to showcase today. She, and all the other designers, presented some really unique clothing I know many would be interested in trying out. I waited until the end of the day to check out the autograph hall. I was avoiding it because there were many long lines earlier looking to snag a celebrity autograph. 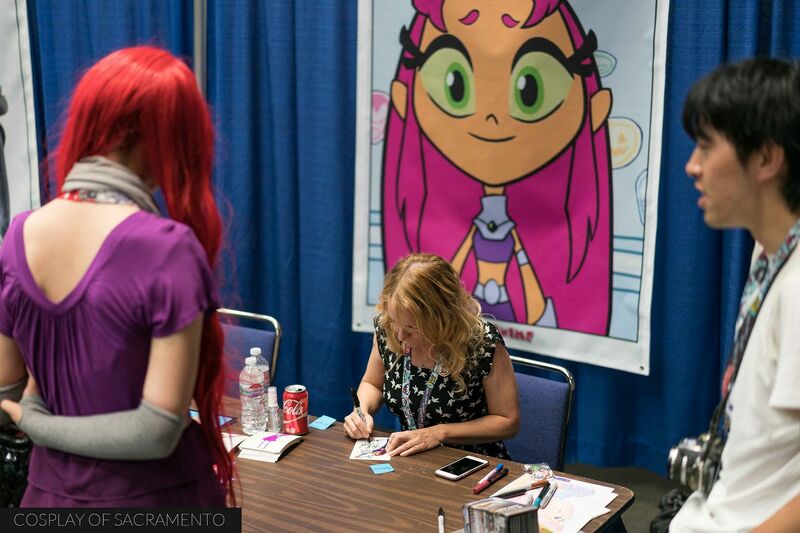 Many of the autographs at SacAnime are free - which is virtually unheard of in this day and age! Whew, I had a really full day today at SacAnime. I felt that I really made the most of my day and can't wait to attend the third and final day of the con tomorrow. If you'd like to see my full gallery of photos from day two, CLICK HERE! 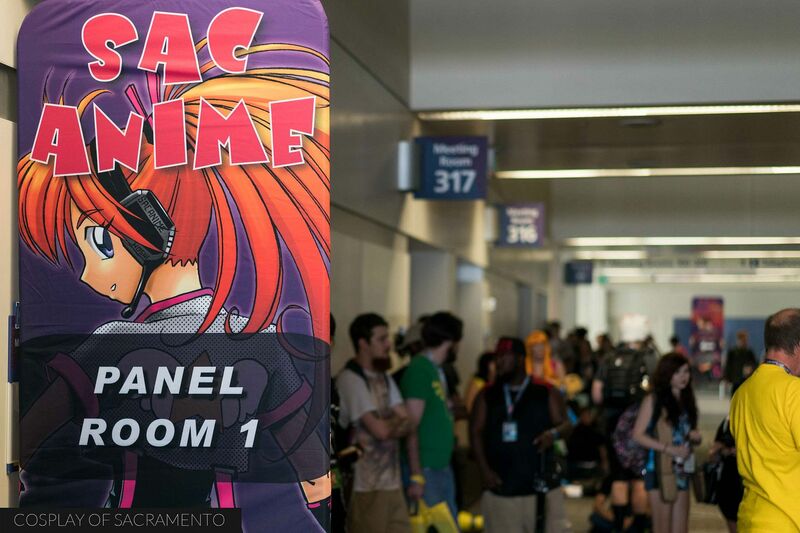 It's Labor Day weekend, so you know what that means... SacAnime! 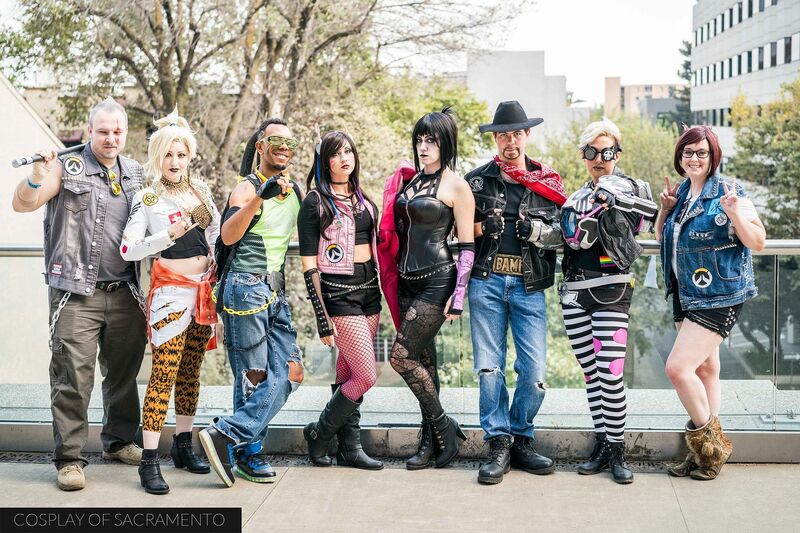 This is a weekend I always look forward to as SacAnime is probably my favorite convention event in the Sacramento area. 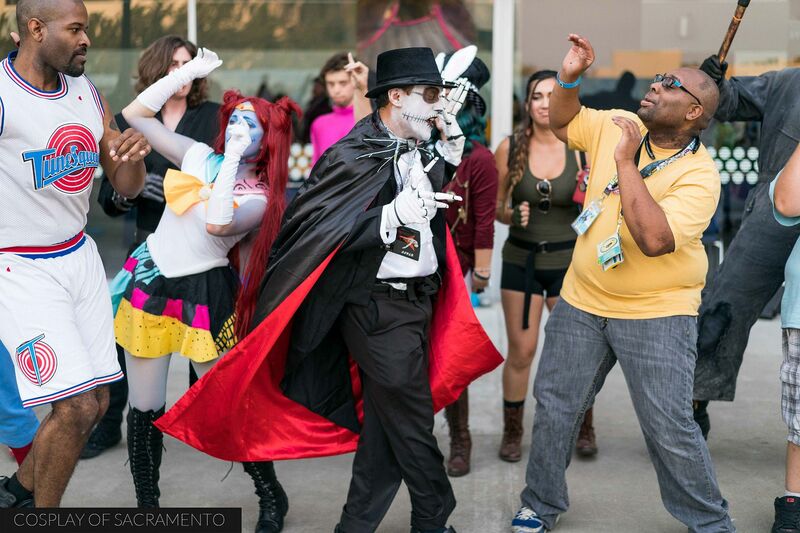 There is always excitement in the air when SacAnime hits and the attendance is always very good. 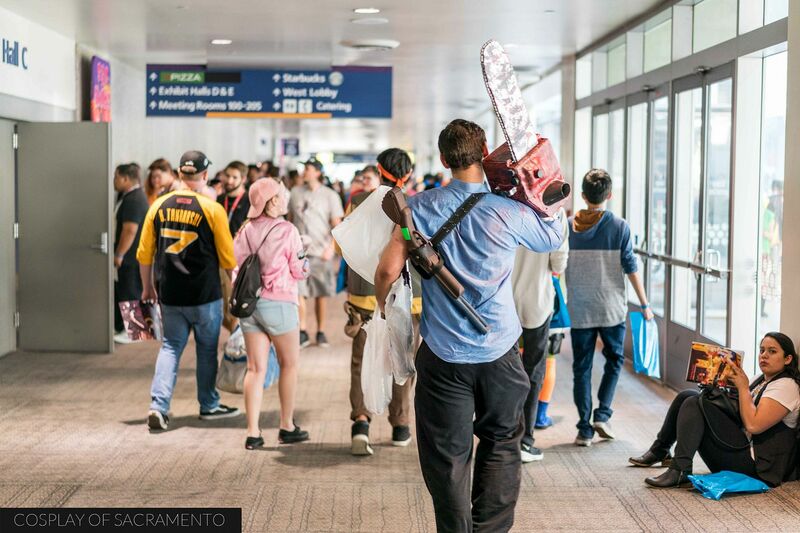 This time around the con has grown to take over the entire Sacramento Convention Center. There was lots to see and do, and this was just day one! The best part about cons is the people who come to them. Over the years it has been a pleasure getting to know who come to them regularly. Many of these people I can call friends now, which is awesome. 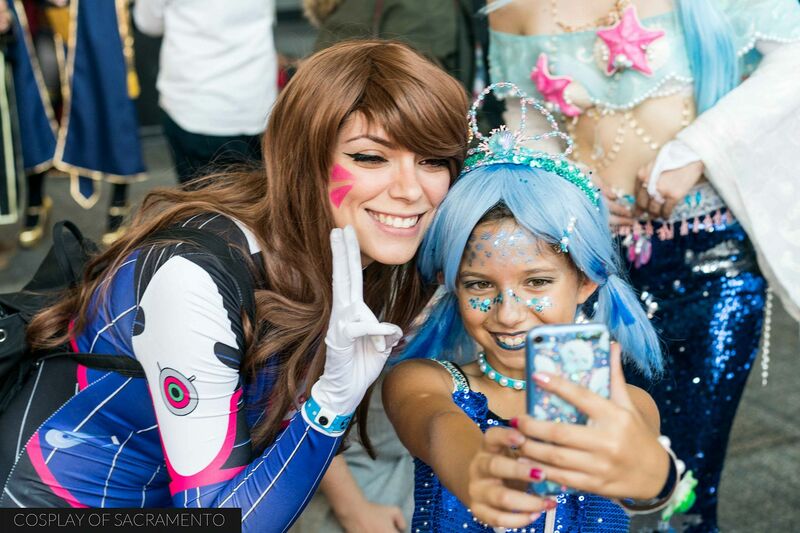 I used to take a lot of selfies at cons - I am not one of those photographers who is shy in front of the camera, but this past year I've done it less. I really wanted to capture some memories with the awesome people I've gotten to know, so it was definitely time for the return of the selfie! 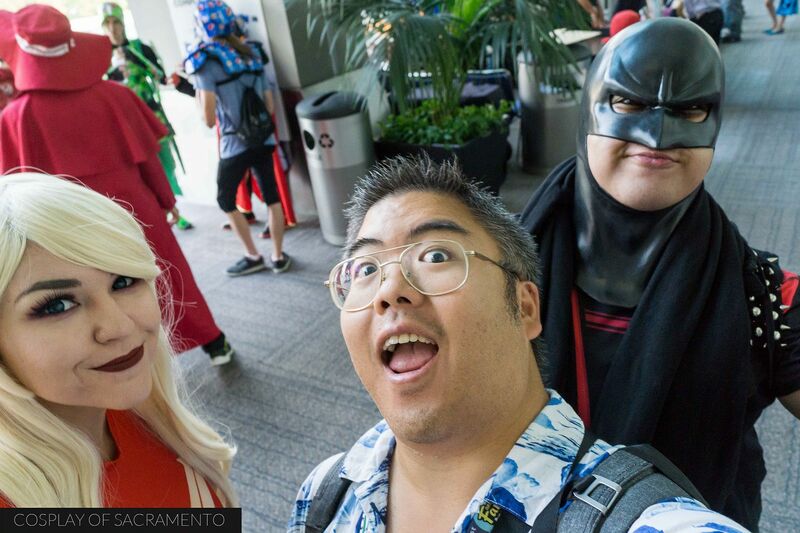 Here's one of me with Nancy and Ivan in their DC inspired cosplay. Besides the cosplayers, I've love being able to 'talk shop' with the numerous photogs who come out to conventions. There really isn't anything I like more than talking about camera gear. Justin is a photographer that I met years ago. It's always great seeing him out at these conventions. He takes fabulous photos and we always seem to get to talking about nerdy photography things whenever we run into each other. In this pic he's holding my Sony camera. He doesn't shoot Sony, but he knows it's AWESOME! 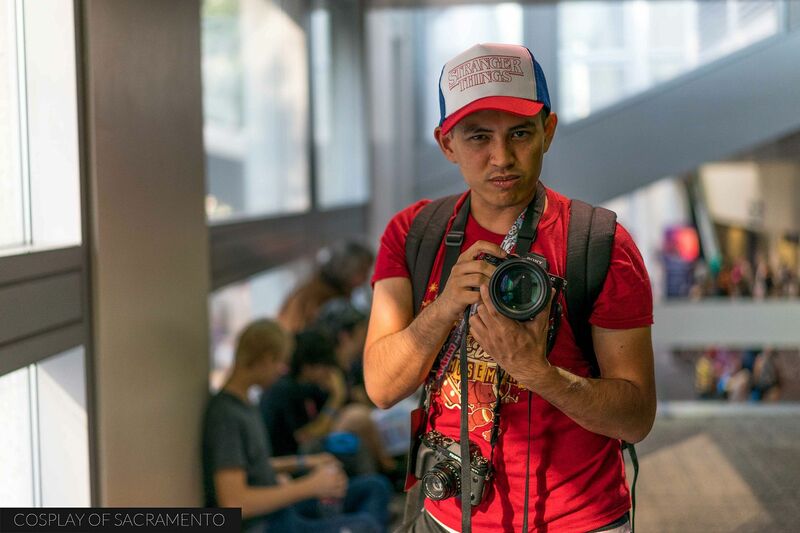 Perry, a photographer that everyone loves and respects in the Sacramento area, set up shop in one of the rooms at SacAnime this year. I usually see him running around getting photos of everything happening - it was nice to see him utilizing a sweet lighting set-up. He had a high quality backdrop and was taking photos of any cosplayers who wanted some great photographs. I'm sure he'll be here for both day 2 and day 3, so if you are a cosplayer wanting some killer photos, see Perry! It was for real over 110 degrees in the Sacramento area today so most people stayed inside the convention center, but as the sun started to set quite a few made it outside to the balcony area to hang out. The balcony is usually packed as it is a picturesque place to shoot photos and have fun. Dave got the cosplayers dancing as the temperature dropped to reasonable levels. I'm always amazed at how many people he gets to get their feet moving. He's an inspirational dancing machine! 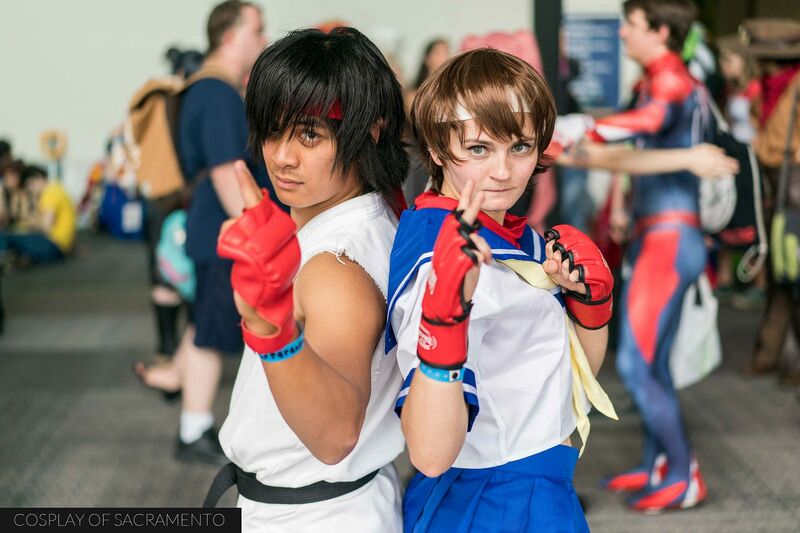 I used most of my time at SacAnime finding awesome cosplays to capture in photos. And it was easy today as the cosplayers come out on fire! There were so many amazing cosplayers walking around. 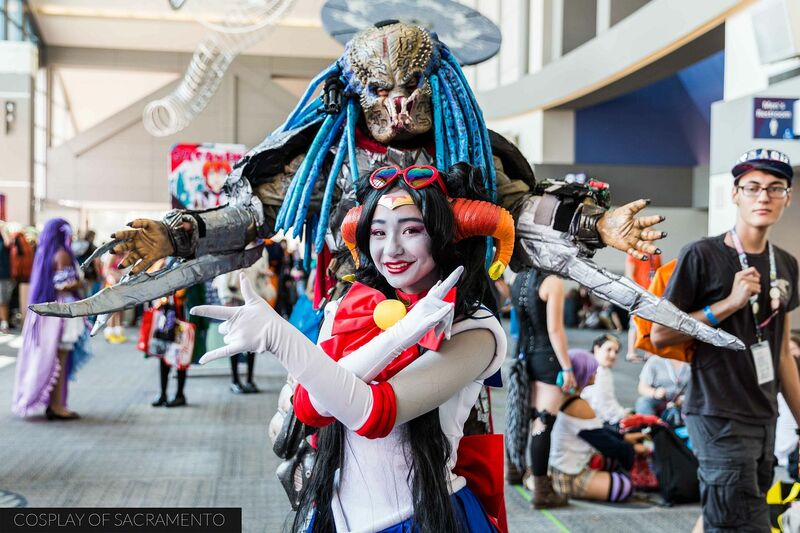 SacAnime really does inspire people to get dressed up. Everywhere I looked I wanted to capture images. And this was just Friday! I can't imagine what will be coming up tomorrow! I can hardly wait! I usually don't schedule photoshoots during cons anymore, but if people ask, I'm more than willing to do one! In my experience, scheduling photoshoots makes the day really hectic. The last time I did that I felt that I was running around all over the place trying to get to the photoshoot locations on time. It's much better just doing impromptu shoots! It was awesome shooting a couple of group cosplays today. 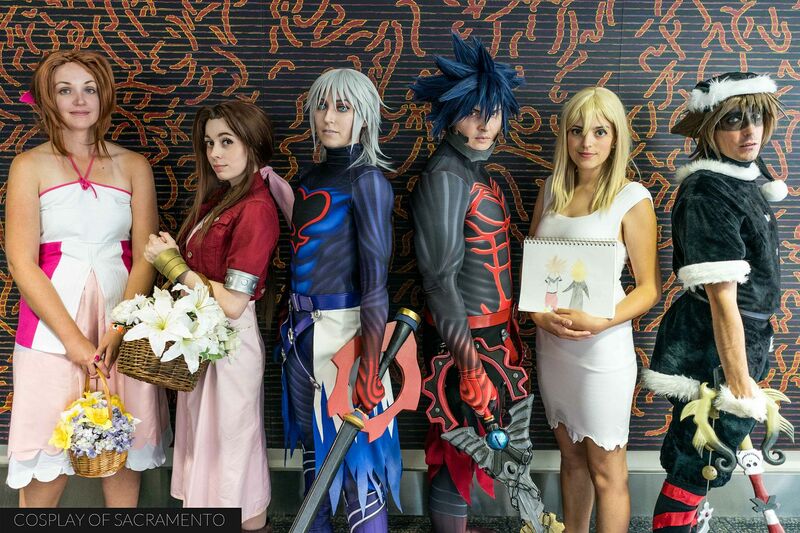 I got to shoot with Cassie and her Kingdom Hearts group as well as Trent's Space Jammers. For a first day, this was really great! 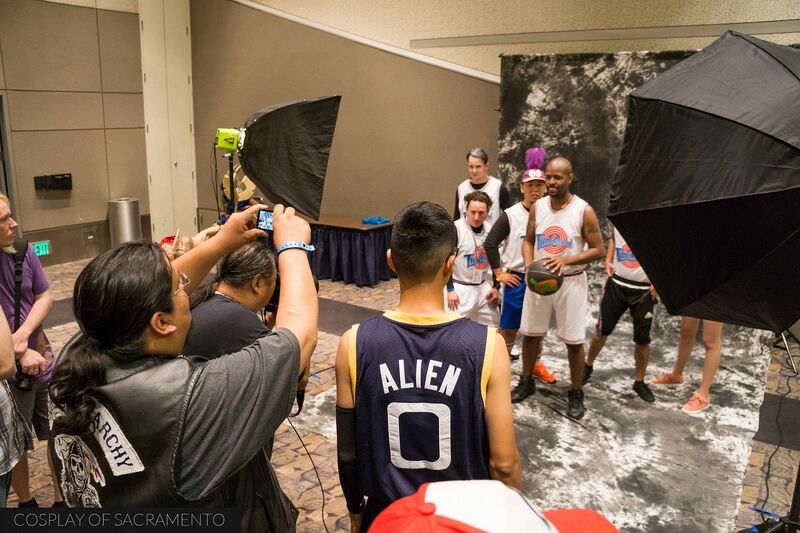 It has gotten me pumped up for tomorrow's big Saturday in downtown Sacramento. If you'd like to see all the photos I've taken today, CLICK HERE for the gallery. 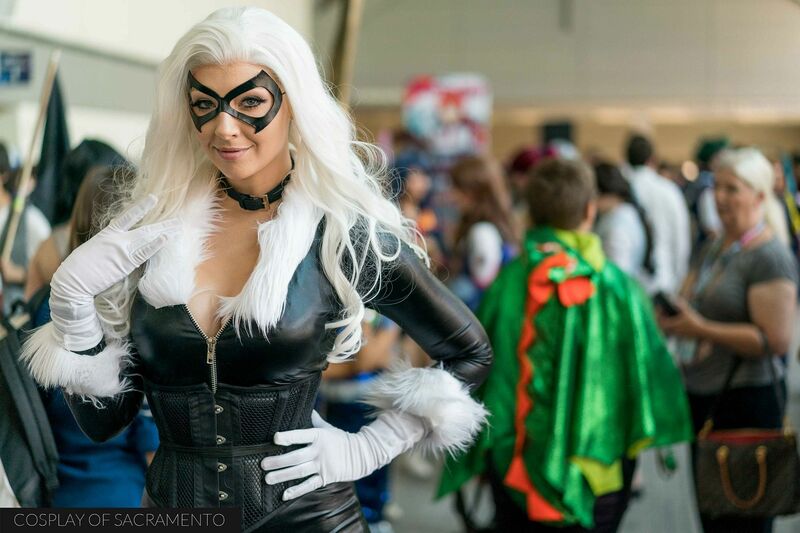 Hope to see a lot of folks out at SacAnime this weekend. I know it's going to be a blast!